Happy Friday y'all! 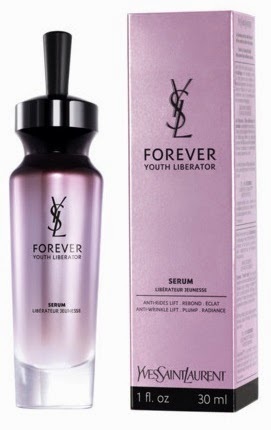 Today I'm reviewing the Yves Saint Laurent Forever Youth Liberator Serum. I acquired for myself several 7ml samples of this serum, and despite having heard very mixed reviews, I was eager to try it out for myself. Eagle-eyed regular readers may recall that Siobhán has already posted about this one, and although in general we avoid posting twice about something, we were both quite eager for me to try it out and see how my skin would take to it (we're ten years apart and have very different skin types, so it was certainly worth a punt). In addition, Catherine (MontyC) had posted (very positively) about the YSL foundation which features this serum, so all-in all it seemed like a good idea to give it a whirl and see how I'd get on. I am a complete skeptic when I read about "anti-ageing" products, and the words "Forever Youth Liberator" bring to mind for me a Disney witch cackling over a bubbling cauldron. Hydrating and plumping, yes I get that, but this product description - "Skinscience has developed a patented powerful serum enriched with a combination of 3 glycans to help increase youthful activity in skin cells", hmmmm I'm not so sure about that one. Youthful activity in skin cells? What's going on in there, an egg and spoon race? Anyway I'll motor on... delivery mechanism-wise, the bottle has a handy dropper that delivers just the right amount of serum to apply to your face and neck. This is very handy. I wish all serums were delivered thusly. Scent-wise, it is quite fragranced, and although the scent is relatively inoffensive it is completely unnecessary. Formulation-wise, it's quite smooth and silky which I like, it spreads well, it absorbs quite quickly (after reading the ingredients listing, I realised that this was probably due to the alcohol content, which was very disappointing to see second on the ingredients list, hmmmm again). It's really around my eyes that I require some youth-liberating going on, but because alcohol is so high up on that listing, there's not a hope in hell that I'll put it anywhere near the delicate skin around my eyes. The bonus of the level of alcohol is that the skin on my t-zone didn't look shiny but that's about it. As for the patented deep-cell collagen-regenerating ingredients and what-not, personally I was pretty nonplussed. The story goes, as far as I can make out, that l'Oréal (who own YSL) have developed synthetic "glycans" to replacing ageing and decrepit glycans in the skin cells, which in turn encourages collagen production (or all so I've gathered), making skin plumper and smoother from the inside. Sure, after a few weeks of using this I did notice some skin-plumpage and a little brightening too but many, many other serums do this. In fact, any serum I've ever tried (bar one which was designed for very oily skin), does this. When I'd finished using it I noticed my skin was a little parched looking which it hadn't been before. Perhaps it's a ploy to convince customers that they need to repurchase immediately to get their skin hydrated again, yes I told you I'm a skeptic. And then there's this article about some of l'Oréal's claims, which doesn't target this serum specifically, but makes an interesting read nonetheless. I have of course, for the sake of drama, saved the best for last. 80 for that, you must be mad! Yup that's right, €80 for a 30ml bottle and I think you can buy larger but I'd personally have a stroke if I saw the price of those. For €80 it would want to make my skin look a good ten years younger. And tell me I'm pretty when I looked at it in the mirror. Absolutely ludicrous. As you can tell, I'm a little maddened by this, especially when it contains irritants like alcohol and fragrance. So that's a big no from me to ever purchasing this (although the 8,000 Boots points would be lovely). I feel like I've been a bit harsh and ranty here. Yes, after using this my skin did look well but it didn't look €80 worth of well. Until next time, anti-age with clean eating. Simples.